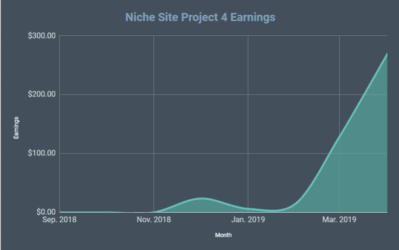 What started out as an idea to share the niche site building process publicly, has turned into a very interesting case study. As I recently shared, my niche site (bestsurvivalknifeguide.com) was created in mid-February and quickly rose to the number 1 spot in Google just a week or so ago. The site currently is bouncing between positions 1 and 3 on Google for its primary keyword “best survival knife”, and is enjoying significant traffic from lots of other keywords as well. In my full report today, I'm going to share exactly how much traffic the site is getting and where its coming from. In addition, I will be sharing the total amount of money made, expenses, and much more. The site has gone from ZERO visits in January to 16,709 visits in April! That really is some amazing growth. 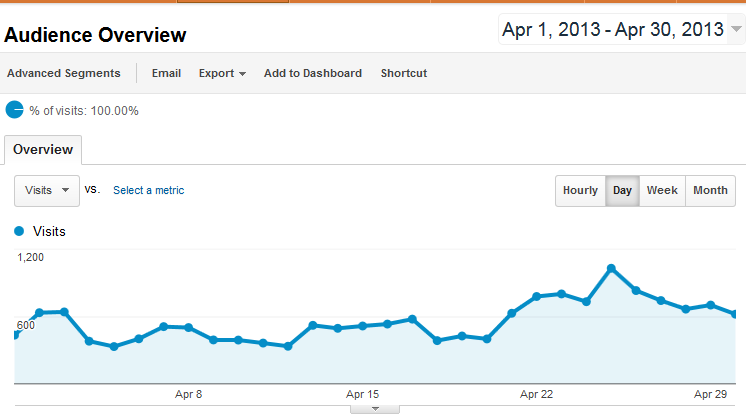 Now here is a screenshot of the Google Analytics for the month of April. You will notice around April 21st when my site started bouncing up to position 1 and 2 on Google – and the traffic has consistently been higher since then. Also, you will notice some additional that the traffic is pretty high and there are some additional peaks. This is basically explained because of people that read NichePursuits.com checking in on my site frequently and in particular when I publish a new blog post here. 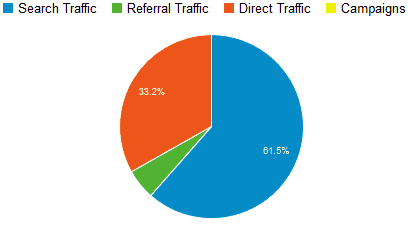 As a result, a little over 34% of the traffic coming to the site is Returning visitors. So, really around 66% of the visitors to the site are NEW visitors, which is really still quite good. (And even normal niche sites will have a certain amount of “returning visitors”, so the entire 34% is not all readers of my blog here). I didn't do anything to get search traffic from these other search engines. I only did what I've already laid out extensively in this case study. Now we come to my second favorite part of this report (my favorite is the income), seeing all the keywords used to find my site! 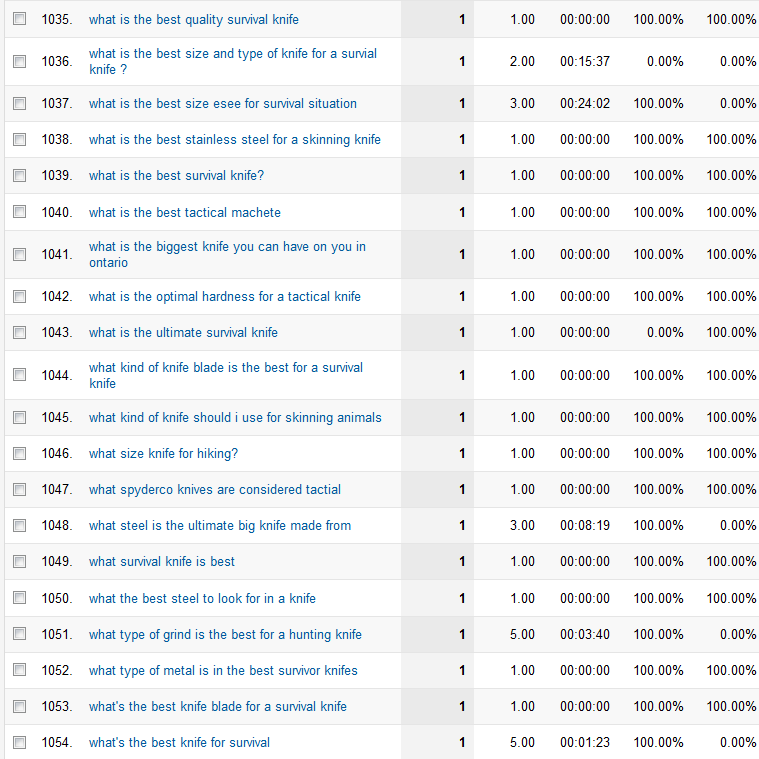 I am actually surprised at the HUGE variety of keywords being used to find my site. Sure, I expected a lot of different long tail keywords based on the various articles produced for the site; however, I'm impressed with the amount of keyword queries that are being used to find my site. I did all my research for the primary and secondary keywords using my keyword research tool, Long Tail Pro. In total, I received search engine traffic from 1,083 search queries in the month of April. The term, “best survival knife” was by far my biggest search query, but you can see in aggregate, that MOST of my traffic is coming from other keywords. This is normal and should be expected. However, you will also notice that many of the keywords include either “best” or “survival knife”. This is one reason why its important to focus on one primary keyword to start because you get both the searches for that exact keywords and lots of related searches. Then I am clearly getting lots of searches to my additional content on the site (not just my primary article). For the month of April, I continued to exclusively use the Amazon Associates program to monetize my site. The income for April was $356.42! Sweet!! To remind you, the earnings in March was $83.86 (see report here). The primary reason for the month to month increase in revenue is due to the increased traffic. So, overall, the site has made me $440.28. I am using the EasyAzon plugin to insert and manage the Amazon affiliate links on my site. The plugin makes it much quicker to find and insert links as well as change certain settings (like cloaking, ad previews, and more). Seeing the income is nice, but its also important to take a look at the expense side of things. I've detailed previously here what my expenses had been up to that point; however, I am going to cover everything here. 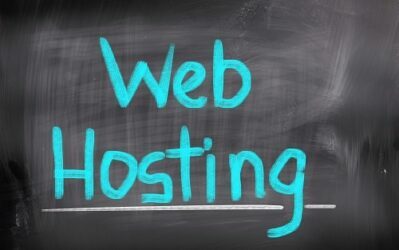 Hosting with Bluehost: $17.85 (3 months at $5.95/mth). However, I also can share this hosting account with other sites, so the true expense is spread out with lots of sites. Articles: $392. There are currently 22 articles on the site. (So, that's an average of $17.82/article…yes this is more than I usually pay). Link Building: $244. About $25 for a VA to submit my site to web directories; then $219 for link building service through LayeredLinks.com. A big part of the influence for my overall link building strategy came from the Link Building course called Point Blank SEO. I highly recommend it if you want to do your own link building or learn more about how a good link building strategy should work. I am using the Niche Website Theme (which I created) on my niche site. Since I already own the product, I'm not putting it as an expense. However, its currently being sold at a discount right here. So, in total, I've spent $713.85. Subtracting my overall income leaves me with a net loss of $273.57. If this site does as well as it did in April, I will turn a profit in May. And I actually expect that the site will earn more in May than April because it should have a full month near the top of Google. My expenses will also be significantly less as many listed above were one-time costs. I may spend another $100 or so on articles in May, but that should be about it for the expense side. So, if I hit my goal of earnings $500/mth starting in May; I will have a passive income stream of $500 each month on a total investment of less than $900! That's a really high Return on Investment obviously. Overall, I am SUPER happy with the way this niche site has turned out. The site is doing very well, and I hope the success continues for a long time to come. My plans going forward are fairly simple at this point. I will continue to add between 5 and 10 articles to the site in May, and possibly in June as well. Depending on how the site is doing, I will re-evaluate in a month or so if I should ramp up the content even more or if I should just leave the site as is. I have been building a small email list, but haven't quite figured out what to do with it yet. I have a 4 part auto-responder series that is likely bringing people back to the site, but I'd like to explore some affiliate opportunities. Hopefully in May, I can find a good fit. I currently have 67 subscribers on the survival knife email list. I could likely add a ton more by adding a splash page or pop up. As always, I want to be as open about this case study as possible. 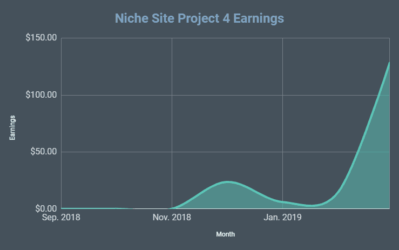 I think that I've provided some valuable stats, screenshots, and more on this income report that can help you evaluate what's going on with my niche site. However, I also know that you may have additional questions that you would like clarification on…I'm here for you! So, please leave any thoughts or questions that you might have below. It seems the affiliate model niche site is bringing profit faster than monetizing with adsence. I’m with you on that on JP. I am completely astounded as well. I suppose I shouldn’t be Spencer is a pretty skilled person. I couldn’t have imagined him not being successful. I mean based on all the of the knowledge he has laid out, he knows his stuff. I can’t ague with that at all. Wow. That is some amazing growth, Spencer. Absolutely crazy. Since some of the traffic can be attributed to you revealing your site on your blog, I’m very glad you posted screenshots of your Amazon sales. Hard sales numbers don’t lie. I bet they will be even better next month, and then this project will be in the green already. Speaking of which, thanks for holding nothing back in this case study. Honestly, I don’t know if I would have had the stones to publicly reveal my niche and site like you have (due the problems that you’ve already encountered), but it seems to have turned out very well. Inspiring. Thanks for the case study. You are incredible! Good job! Still trying to get one of my freaken sites to just RANK! ugh. Keeping the faith. Thanks for all you do! Best of luck Kyle…hopefully some information I provide here will help out. All the long tail traffic is amazing. I’m wondering if building a list for this type of a site is the best way to go. I’m thinking you might be better off just monetizing straight off with Amazon affiliate links, unless you have another super-targeted product to sell them. One way to monetize it could be to set up some code to monitor the RSS feed of Amazon Deals of The Day for anything with the keyword knife and then send an email to your subscriber list with an affiliate link for the deal. How much did you know about the subject before you set up your site? Dude! Thanks for going back-to-basics with this case study. Incredible value in these posts, and I have really appreciated watching you stretch yourself publicly and excel in a new field. A lot of us (myself included) have been hesitant to re-enter the “niche/affiliate” site business again after Penguin. You have successfully re-buoyed a lot of small IM dreamers and given them new focus. I’m wondering about an email list for the site as well. You know what would be interesting…to see you continue to take the site up the value chain. Add other, related product lines and maybe (eventually) turn it into a dropshipping site if the traffic continues to grow. (Or even source the products directly). That would be a pretty amazing journey to follow, I think. As usual Spencer, you rock! Great experiment and amazing results. I love what you’ve done here and I think you need to do it again. In June, you need to do the same thing again and see if you can’t beat this site. What do you think? Maybe you should join in the Niche Site Challenge 2 with Pat Flynn. He’s starting it up again if you didn’t see that already. I know you were involved a little in that after it got started if I remember correctly. I DO plan on doing another niche site project (as I mentioned at the beginning of this year). However, I’m actually thinking maybe I will reveal WHAT I am doing on this second site and NOT reveal it until its ranked at the top of Google. This might be more interesting to see because the case study won’t be affected by my readers here at all. I actually just recorded a podcast with Pat and we discussed his niche site duel #2…should be interesting! And perhaps I will participate in some way…we’ll see. Yeah, I was thinking about this too, Spencer. For your next niche study, maybe keep your blog readers updated with what you’re doing, but DON’T reveal your domain, keywords, or niche for the first several months (if at all). That way, you can keep everything “uncontaminated” — by both followers and haters. Yep, this may be the way I go on the next one. I think that is a great idea Spencer. . . it will prove to people that KEYWORD in fact is the most important not blog readership, links, or anything else. I’m folowing your results closely. Can u give a bit more details about LayeredLinks.com, for how many keywords or anchor text have u used it? How long it took to see the results. Already doing some link building but results are slow. what service have u used for – VA to submit my site to web directories ? 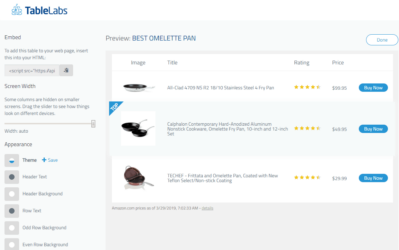 Does the easy azon plugin work seamlessly with TablePress? I thought I had read in one of your previous posts that you were creating .csv and then uploading via Tablepress. How are you using the two together (easy azon + tablepress)?? I am using the two together, but I wouldn’t call it “seamlessly”. Essentially I created all the links with EasyAzon, but then I had to manually copy and paste the links into my CSV file, which I then uploaded. Although, once the table is uploaded, you can manually edit the links or whatever directly in wordpress (from the plugin page). So, it works with just a little extra effort. HEY Spencer, first of all i want to congratulate you on this great project and for you sharing so many details with all of us. I got so inspired that i definitely decided to do my own! One question – why didn’t you use the feature of easyazon that finds the amazon store closest to where your customer is? For instance, i am based in Portugal and it still takes me to the amazon.com while i would have a huge advantage to buy it from amazon.co.uk (who delivers for free all around Europe for any purchase above 35 pounds). Is it because it would mess-up with Tablepress? Spencer I think you have done a great job detailing the entire process of creating this niche site. And again, thank you! My only suggestion is that I wish you would focus more on the back-end of WordPress SEO. Not necessarily a WordPress tutorial, but how us newbies can make sure we have all the right “bells and whistles” turned on and functioning properly. For example, I figured out today that my “slug” on my static page was “sample-page.” I changed it immediately to my keyword. I don’t know if this even matters – but if it does, this is something I would have benefited from knowing earlier. Not sure if this all makes sense. Hopefully it does. My only other question is that when using LTP Platinum, can you get dinged by Google by checking your sites ranking too much? I have never used layeredlinks.com, but it looks like it may have been useful. Have you used them before for your sites and do you recommend? Yes, I’ve used them before – recommended (sure wish they had an affiliate program 🙂 ). How did you like the layered links service? Worth the $? Or have you covered that question somewhere already? Yes, was worth it because its so hands off – and it works. Hey Spencer, I sent you an email regarding Dori’s idea (selling the site). I think you’ll find the link in there very interesting. 1. What’s the difference between Amazon and third-part products? Are the later not shipped from Amazon or maybe cheaper? 2. 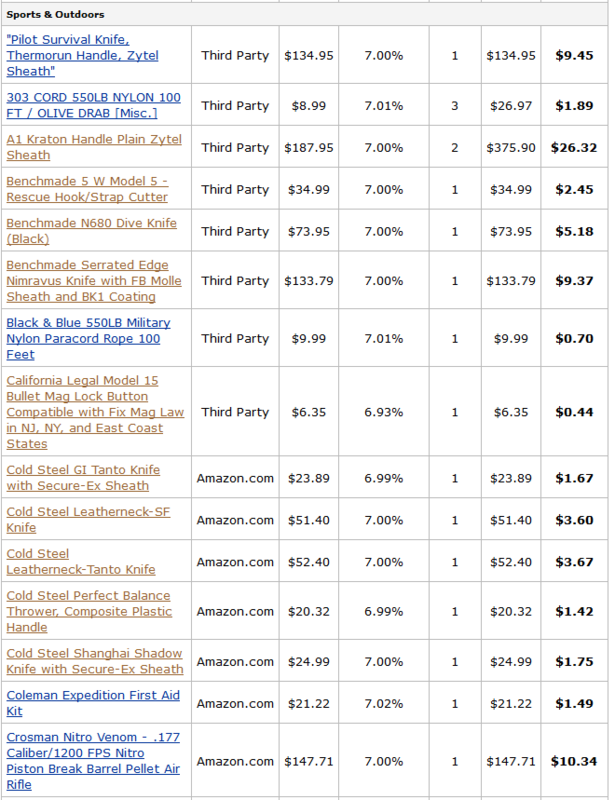 Since you’re using the EasyAzon plugin… does it mean you don’t log into your Amazon account and find individual knifes/other products to promote/grab the link from? Does it have a built-in product finder already? 3. Can we get credit for Amazon sales that come from referrals clicking on our site that already have their own Amazon client account? 4. You once said that you had to join the UK Amazon affiliate program… and other countries… is there a reason why? And how does that work for you? 5. What’s your take on automated link-building software like magic submitters and social media posters vs. manual link building/commenting/back-link networks? 6. What’s your favorite back-links indexing service? Why? Hope it’s enough for you… going to take off for now, my eyes hurt a bit. 1. third-party products are sold by other companies (not shipped by Amazon) on Amazon.com. 2. I don’t have to log in to amazon to create affiliate links. Built-in product finder. Quick search. 4. I did join the other country affiliate programs because EasyAzon will detect what country the user is from and send them to the correct Amazon page. (I wouldn’t get credit for sales made in the UK/Canada otherwise). I didn’t make any sales outside of just Amazon.com this month. 5. I don’t typically like auto-mated software for link building. 6. Don’t use them; but I hired LayeredLinks.com and maybe they did. Haven’t heard of LayeredLinks.com but looks like a decent amount/quality of links for a good price. Do you point ALL of their links to your niche site or some also to your tier 2 articles/sites? Definitely looking good. Keep it up! Thats a really good investment right there. Another big WOW again and again for your Huge achievements Bro. Spencer, I totally agreed with @Bradley that its hard to put your site on public due to security and to avoid unexpected jealousy from competitor. But with your super revealing Thesis it makes me feel more motivated. I Thank you for that.. a lot. That’s awesome, Spencer! I’m so jealous, but in a good way. I would love to see you scale this up. I mean, why not, right? My new niche sites are now just over a month old and barely getting a trickle of traffic. So, I guess I’m going to have to get right back into following through with all the steps you’ve taken here in this study. backlinking is niche site gold… most people dont want to invest in it or do it. That’s fantastic Spencer. I really hope you hit the $500 mark in May. I think it’s really important to set an earning goal when starting a new site. Much better than just building a site and hoping for the best. It makes it so much more rewarding when you make it and it provides confidence when selecting new niches down the road. Thanks for sharing your progress. Congrats Spencer. I published my income report for a public niche site last night. My site, unfortunately, took a bit of a dip in the keywords it was targeting but made up with long tail traffic. Of course, this site was found using LTP so thanks. Curious, have you found any copycat websites pop up yet? It seems like ever since Pat Flynn shared his security guard website you see a ton of copycats or atleast every other domain ending in HQ now. I’ve seen at least 2 copycats (can’t remember the domains, though). But both of them were only half-baked efforts compared to what Spencer’s doing with his site. My guess is that they tried to copy, but weren’t willing to shell out the money for a good theme, header, backlinks, etc. I have noticed a couple of copycats (others have pointed them out to me), but none of them are doing very well from what I can see. Great job Spencer- so inspirational! I find it very interesting that the copy cat sites aren’t doing so well. Care to speculate on what are doing or not doing? 1. Are the customer ratings being pulled dynamically. 2. I see you can sort by headings. Is that the plugin doing that function? Thanks so much for sharing your process. Really great case study, your helping out BIG TIME. Not many can do what you have done on here. What are your thoughts on Alex Becker from Source Wave. Really don’t know what to make of him? What would you speculate your earnings would be if you used Adsense? That’s a tough one. Since I haven’t tested, I don’t really know what the CTR or earnings per click would be. I actually think this might be one niche where Amazon is more than Adsense. But I actually have sites that get less traffic than this that earn more with Google Adsense (but its a totally different niche that wouldn’t work with Amazon). Interesting point. Could your share a couple of keyword examples or ideas which are effective for Adsense? I have 2 product based sites but have no clue for where to start for Adsense sites. There are millions. Pat flynns: Security Guard Training is a perfect example though. Congrats on another awesome money maker! I just got Long Tail Platinum, and I’m ready to get cracking. I was wondering who you would recommend for article writing, and how much they charge? Anyway, I really appreciate the great content. The info you provide both here and in the Long Tail Classroom makes me think that I might actually be able to succeed online! Thanks a lot, and keep it up! I’ve used either Textbroker.com or hired someone on Elance.com. First, congratulations on the really great success with the project Spencer! I have more detailed question on how exactly do you give orders to the writer(s) either on TextBroker or Elance? I checked the content of the project site and the quality of reviews is really good, with a personal touch (like one person wrote the whole site). Did you give them specific resources to research before writing, some sample reviews with format that you liked, or just gave them the keyword, explained in more general words and let them do the rest of work themselfves? I’m asking because since I initially was writing all the content myself, I still have this crazy perfectionist habit to dig the resources, compile a list, and give detailed explanations on approximate format and storyline of writing. That’s kind of doing half of the writer’s work myself! That takes me a lot of time to do actually. Could you please explain in more detail how you approach content ordering? The articles are very good and mostly written by one person hired on Elance. He is a camping and survival expect with lots of experience with knives. So I gave him very little instructions – I essentially told him I wanted reviews done on specific knives. I didn’t give him any keywords to use – just the titles of the articles. So its all very natural and he could write the review how he felt – either positive or negative about the knife. Honestly, I pretty much found a good writer and then let him write how he wanted, in his own voice. How can someone write a good review without having the actual knife? I guess they “make it up” from reading other reviews online. There’s an incredible amount of detail available online about knives and all other products. Close up pictures, materials used, sizes, and much more. When you’ve used a ton of knives – like my author has – you know what makes a good knife. You don’t have to own something to know its made of poor quality or good quality material, etc. This is so cool Spencer, well done brother. Been following your site for a while and really appreciate all of the great content/tips, especially this recent case study. Would you be willing to email me the contact info for your elance writer? He did a great job. I’ve found a great keyword in the camping/survival niche and could use a good writer. It’s tough finding a good/quality copywriter. Would really appreciate it, and don’t worry it’s not the same niche. Brett, I would, but I actually know this author is swamped…and I’m likely to keep giving him more work. So, I’m going to be selfish with him for a bit since I have more work for him to do…sorry! (However, you would be surprised on what you can find on elance…I’m sure there are others that could do a great job). Thanks for the great explanation Spencer! For niche sites, I guess it’s indeed a great strategy to hire a person that has good experience in the field. I too mostly work with 1 writer because she just grasps all my requirements and always produces great output. This is awesome Spencer! Now that you have all those long-tail searches in your analytics, you can create posts around them. Yes indeed, great thinking. I have alot of excellent data to help me going forward. i used to make $500-$600 from adsense every single month in the past. but then something happened and I become a big failure on more than 20 sites. I dont understand what is going on. For example my one year old site is ranking 200 for its primary keyword. After a year when I create just only one single backlink with phrase-match anchor text, then my site losts ranking and never come back again. I tried this with more than 20 sites. I don’t know obviously without seeing the sites. Could be one of a hundred things. I just recommend trying to follow what I’ve done here. thanks for your fast reply,sure you can’t say without seeing. both you,pat and some other marketers has done successfull niche projects. It’s 90% clean but some little blind points. For example web2.0’s linking to our money site. How to create them? Before the main site go live or after. One post on 2.0’s to get indexed and 2nd with backlink to money site or just one single post with the backlink to money site. And also thanks for your awesome posts. I really appreciate what you are doing here. Sharing all of this information so we can learn from your experiences. One thing I did notice was the amount of traffic you are getting from the different search engines, especially from the major players (Google, Bing and Yahoo). With a quick calculation, it seems like you are getting 97% of your search traffic from Google. However if you check the market share of searches, it is said that Google has only a market share of +- 67%. With my sites I also receive most of my search traffic from Google (Always more that 90%). Does this mean that Google is actually getting more traffic and searches than what is being shown by the “Gurus”, or am I missing something here. I would love to hear your thoughts on this. Very nice Spencer. I appreciate you laying out ALL of your expenses. This provides a nice understanding of how, where, etc money need to go in order to get a site where it needs to be. When tied in with the other tips taught in this project I think you have laid out a great path to build a growing authority site. Thanks again for all your openness with this project, I admire your courage to reveal as much as you do and your skill at your craft. This is so just-in-time for me because I am building a amazon site too (in an unrelated niche) I have been following very closely to pick up any tips I can. My site is about a month old and has been sitting in the mid 20’s on Google, but bounced up to #20 today (page 2 baby) I have not been doing any link building at all yet, although the domain came with about a dozen links from 2 domains so I am sure this is helping as they look to be legit. (one is a business directory and one is a forum, both related to the niche) I am building out articles and product pages to flesh out the site so I am not planning on promoting it until it has a bit more content. Sorry for the rambling but this brings me to my question, I notice on your site you are putting up reviews of the products you promote, where I have several longer articles with links to product pages, but mostly just product info, like a product description, on the actual product pages. What is your feeling on this? I think that should be fine as well. Best of luck with your site! This is great Spencer – really inspirational to see how you’ve taken an idea, used your resources and tools, and turned it into a stream of passive income. Thanks so much for sharing your toolkit too! One thing I would like to ask is how much of your own time you put it? I’m just getting started on all this and trying to figure out how someone accounts for their time. Why don’t you filter traffic in Google analytics? Then you can filter out all traffic with that cookie from analytics. Interesting. Didn’t realize I could do this. This obviously wouldn’t change the earnings of the site, but it will help see where the traffic is coming from. Do you want me to send you the instructions for doing that? We are all in awe, amazing! My question: You have talked about using Amazon or Adsense. What is your thoughts on using both on a niche site? I would probably use both if the site wasn’t public. (I’m hesitant about putting my adsense code for everyone to see). Thank you for sharing Spencer. This IM world is full of “special offers” that lead to nothing but dead ends. It’s wonderful that you’ve taken the time to give so much good, accurate information. By Copycats do you mean people making exact replicas on survival knives or other sites that followed your model in a different niche? Also how long typically without a successful blog does a, starting from scratch, niche website take to rank in google without backlinks ? I know you have probably mentioned this somewhere but I’ve lost it. Also congratulations this has been a great learning experience and I appreciate all that you do! Yes, there are some copycats targeting the exact same keywords. Feel free to copy the STRATEGIES in another niche though, I encourage that. All my niche sites need some kind of backlinks to rank (usually). 90 days is usually a good rule of thumb or when a niche site should be ranking. Spencer was the 50.00 you paid for graphics the knife images or does amazon provide images? Nice site by the way. The $50 was for my graphic designer to design the header. I’m using images from Amazon. Thanks for everything. I’ve been following this project for a week now and I’ve started my first niche site because of you – I’m taking the exact steps you did, only a different niche obviously. I feel this would be fantastic and would help everyone get a better understanding of the actual backlinking process, which I do believe for many is the biggest hurdle. Yes they did give a report. I’ll have to consider whether to share this exact report though. It really doesn’t have to be the full report, that’s probably asking too much. Just a small part of it would do. We all know how Bookmarking sites and blog comments work, for example, so there’s nothing new there to learn for anyone. The Web 2.0 properties would be the absolutely most interesting I think, and if you could share just that, I’d bow to you. Isn’t success a great thing to motivate us all? Not many would have shared what you have done to achieve this so a very big thank you for that. I have used your Long Tail Pro for keywords and one site is ranking No 3 in Google built the same as yours (different niche of course and in the UK) and made it there in about 4 weeks. I have paid for many courses in the past and yet your information freely given has done more for me in 6 weeks than all the courses put together. If I can ever repay the favour just ask – not sure how I can but know that I would. Wow, THANK YOU Enda for the kind words! It is SO great to hear that you are having success with the strategies I’m teaching. Thank you!! Looks like you’ve got 90%+ anchor text with the phrase “best survival knife” — that is pretty aggressive. Very impressive traffic stats! Of course there will be some people coming from this site to your site but your Amazon sales can’t lie and even with the likely poor converting traffic from this site your value per visitor is still $0.02. With this being one of your first Amazon focused sites how does your value/visitor compare to your AdSense sites? and are you considering switching any of your AdSense sites to be more focused on Amazon products? Its pretty good. I do have several adsense sites that earn more per visitor, but as a whole this is pretty decent. I won’t be switching any of my existing sites over to Amazon, but I may be build more Amazon sites in the future based on the success of this one. Excellent results! and thanks for sharing your data with us. So may I know how many keywords I should focus on for each niche site ? Thank you very much and hope you will get big income in May. Awesome to see the great success Spencer. It’s great to see all the numbers on how things are working for you. I’ve learned a lot about building niche sites from your survival knife site. I’m planning to start my second niche site shortly. However, one of my biggest issues is finding the correct topic. My first niche site failed to hit a few key points, but most of the problem stems around not picking the right keyword, and not researching my topic correctly. However, it wasn’t all bad because it was an incredible learning experience for me. Thanks for all the great tips. Awesome. I was blown away Spencer. 16k+ visitors in one month. It was incredible! I have to work out a way that will improve the traffic and earning of my niche site as well. You are such an amazing inspiration! Even if you don’t reach your goal of $500 monthly that’s still an incredible total. I am trying to adopt your strategy but I’ve only reached page 4 on google. Boohoo. Does anyone know if there is a timelag between backlinks showing up in “backlink checker” services and them providing juice to Google SERP? I ask because I have built a bunch of links and I believe my site has benefitted but when I run backlink checker tools I don’t see these links. From the stat what I’ve seen is the major incoming links comes from your primary keyword, which you may easily get from free google tools. Please explain what you mean by “in aggregate, that MOST of my traffic is coming from other keywords”. 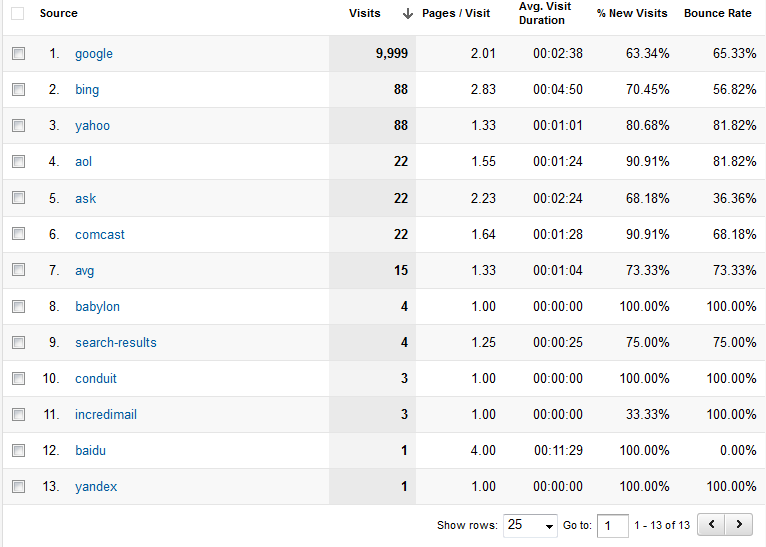 I posted an image of my Google analytics above showing what keywords were bringing in all the traffic. 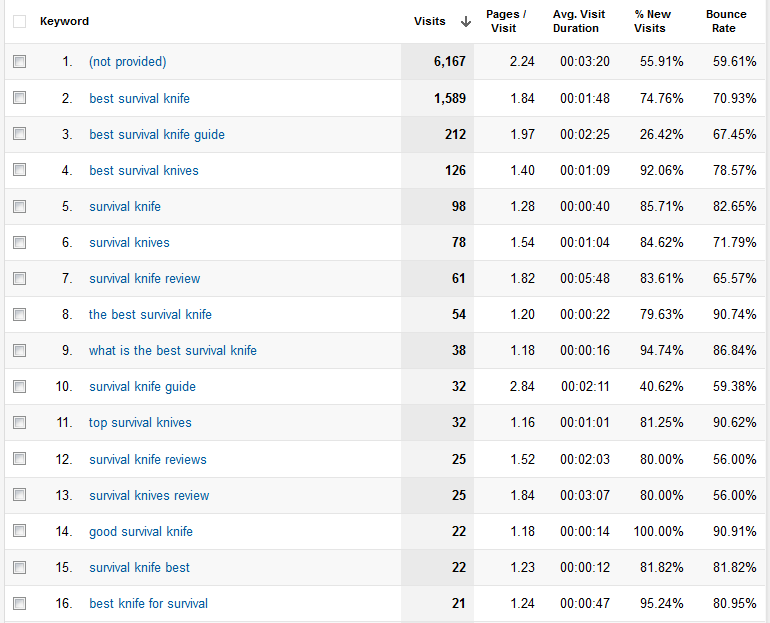 Most of the traffic came from keywords other than “best survival knife”. understood but those are only ones..
Hey Spencer, thanks for the absolutely fabulous content on this site. It’s so refreshing to have an internet marketing blogger share their actual numbers & methods for success. I’m wondering if you could comment on the strategy of renting high PR links versus buying back links. Have you experimented with high PR link networks before? Why does the main number 1 keyword from the list show as (not provided)? What factor(s) will ultimately determine when, what, and how much content you will add or whether or not you do nothing? Example: Would it be current rank in SERPS, current amount of monthly visitors, current earnings, or other? Also if you could explain the reasons behind any of those choices such as why would you stand pat, why add content, etc. This was an excellent case study and it reinforces the spend money to make money philosophy as well as shows how skilled you are in finding, identifying, and hitting a profitable niche. Others may build 5-10 without having looked at it from enough angles to get it right, well done! I would add content based on earnings. This is amazing Spencer. You are just flat out brilliant. What blows my mind is that just this niche site on it’s own would be completely impressive to my finances. I can’t imagine that you know exactly how much of an inspiration, teacher and coach you are to me and likely to many others. Thank you so much for keeping up with this project. Because of it and you, I’ve created my first site and it’s already on the 4th page of google for my PKW with no links at all! Thank you Mike for the kind words!…Best of luck with you site. Nice one Spencer, congrats on your success! Just wondering how this site compares to your previous sites in terms of time taken to reach no. 1 and the amount of long tails. I know you mentioned you don’t normally spend as much on articles so just wondering if higher quality articles means lower bounce rate, more time on site etc. and if that has had an impact? Its reached #1 a little faster than normal. Although around 90 days is not unusual (so this was about a month faster than usual…at least). Some sites takes six months though (or never 🙁 ). The long tails are actually a bit better than usual on this site as well. I do think the higher quality articles are producing more time on site and lower bounce rates. I’m likely to keep hiring more quality authors for future sites. Cool thanks Spencer, good info to know. It’s been a bit of a juggling act with Adsense and time on site e.g. when I improve the position of my ads I get better CTR but my avg. time on site goes way down! I’d say find your own niche, because this one is just going to keep getting more competitive with a bunch of copy cats (you aren’t the only one). You’ll make more money if you find a less competitive niche. Seriously. Awesome! You are getting so much traffic and making money so rapidly. Tell us how you get that traffic. Congratulations! You have done a great job! Thank you for sharing this project with us! Another awesome post Spencer, this is really inspiring stuff. I will be using some of this to help me with my niche site building soon…. Spencer thanks for sharing this case study. I have followed it very closely. It has helped me to see a lot of the mistakes I was making and what I can do going forward. For the record I started a site just after you with an equally competitive KW #2 after a month with only two mega pages on the site. Two directory links and a couple of FB shares is all it has taken. The keyword research is huge and LTPP is the most useful tool I have today. I find it hard to find viable KW’s with the Volume you found though. As to the copycat sites I have found 90% of them by searching for unique strings on your site. Most have just ripped the text and changed a few words, they are not doing well. Many have targeted competitive KW’s they are not doing well. A few have pretty much re written everything just maintaining the Idea of a table etc they are doing well. The Data aspect of this case study is very interesting to me, by simply following your lead I compiled data on 128 products a lot of hours yep. What I got though was lots of ideas for new pages that don’t exist on the web and an education on the product, that allows me to create a site that has value. Compiling that data is tedious at best but I believe it to be a key ingredient in creating websites that will stand the test of time. Thanks for your report,I learn a lot from your blog. That is amazing! Once you break even and start making $500 a moth from this site is will be a great achievement! You could sell the site for 10x$500 = $5000 and build 10 more. Or just keep it and watch the money come in each month. Did you cover the link building you did in another post? I didn’t realise you spend $200 on links already. Yes, I could sell my site for 20x monthly earnings. I could easily list it on http://empireflippers.com/marketplace/ – all their listing are 20x monthly earnings…and they always sell. So if I hit $500/mth in earnings, I could turn around and sell it for $10,000. 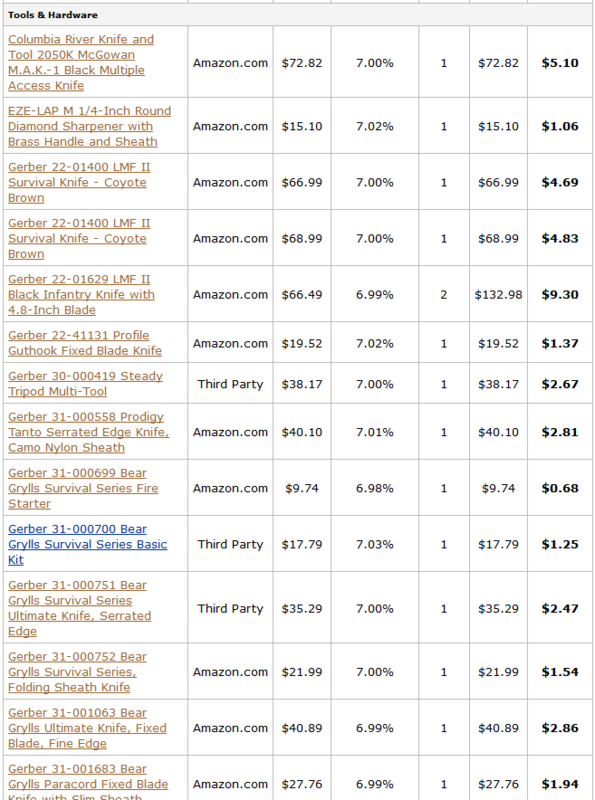 hi spencer, is your best survival knife guide website is same as your adsense site? Yep, pretty much exactly the same. Only difference is that I add Adsense ads. I have a suggestion for you to make a lot more money. 1) Source the same products direct from supplier. 3) Still use the referral links and earn associates commision on top! Hope this helps. Thanks for your inspiring work! If you only knew just how hard it is on Amazon 🙂 Firstly you need a crawler to update prices hourly, so your winning the buy box, otherwise you will not sell a lot. Margins are around 10% for knives on a good day. 7% for just promoting the product is a gift and not to be viewed lightly. I forgot 15% commission to Amazon.. I’m pretty sure you can not get commission back on your own products as an affiliate. Source knives that are not already on Amazon as well. Really have to give you props and big thanks for putting this together for your readers and all for free! Might just be the most honest case study I’ve seen of its kind. This is great! All the best in meeting your sites’ future plans! Frankly it seems a bit unfair. You made Amazon thousands of dollars and didn’t get too much in return comparatively. Minus the 7% paid to Spencer. The table with sorting on the top is a plugin or add-on for wordpress? Where can I get that? Hi Spence, again congratulations on a great result! I’m a big fan since I bought your Longtail Pro Platinum and the Classroom. Seeing you get such great result, always gives me more motivation to build more projects. It’s going to do better now in the next months so good look. Keep us up dated. Thanks for this great post and excellent replies. Just wanted to let you know, I’ve subscribed to your mailing list to see what / how you are doing. I guess some of your other 66 readers, are also from this blog. I’m looking forward to hear more about your progress, as it’s an exceptional education opportunity for beginners like me. Can you tell me what you would do with the content on your site if your site got penalized by google and you could not recover your rankings? Would you delete the content on that website and try to post the content on a new domain and build links to the new site? Is that a good idea or do you have to write entirely new content for your new site? When using a number of domains in one host (in your case BlueHost), how many domains in a hosting account do you often do? Is there a reason why you do limit it to that (assuming you do)? Great stuff so far. Your idea on keeping the 2nd niche site under wraps is a good idea and nice comparison to this one. I guess we’ll see how much of a difference the visits from here make. Also, it’ll probably rid you of the headaches of negative SEO (or at least lessen it). Maybe 50? More than that could slow down your server depending on the site/traffic of your sites. Which one would you go for today? Amazing work Spencer and thank you for showing your progress and stats. It provides great motivation for those of us who are still trying to rank and form our own niche sites. I love the insane level of detail in this case study, Spencer! One question: have you considered building brand signals by creating social media profiles on sites like Twitter, G+ and Facebook? Yes. I actually am starting a twitter account for this one…we’ll see if I do anything else. Congratulations to your project outcome. The blog post is very inspiring especially to newbies like me. Question. How many hours did u put into this? You mentioned that the writer you engaged from Elance is a camping expert with knowledge in knives. I presume that is what you would request in your job description in Elance? Just wondering if being so specific ends up jacking up the price of the articles written? I am thinking of a niche that I would definitely need help from outsourced writers with good knowledge in that area. Would you recommend that I be very specific? In the job description, I did indeed say that it would be BEST of they had experience in the area. Yes, I would recommend it. I am loving your public niche site project. I recently started a few of my own Amazon niche sites. I encountered a Google penalty on one of my sites (for too many affiliate links VS content I think) , so I beefed the content up and the penalty was removed but I never properly regained my rankings. The site was achieving 600 unique visits a day but now I am lucky to get more than 100. I am going to try some of your backlinking strategies now. PS. I am looking forward to seeing what you decide to do with your newsletter as I too have collected addresses but don’t really know what to do with them. You know that person that thought he was hurting you by attacking your site with links….I think he actually did you a favour and helped your site rank. Unfortunately it doesn’t help the case study and for how long who knows. But …. Something is wrong with google because I’m seeing new sites ranking very quickly and they have massive amounts of backlinks. One site in a very competitive niche has built 40k links in a month and is ranked 1?!? I think potentially what google say works and what ACTUALLY works may be two different things at the moment? The links to Spencer’s site which someone built were of such poor quality (I’ve checked many of them manually), that I really don’t think they are worth a damn. They are basically the kind of links you can build by running an automated piece of spam software for 30 minutes. I really doubt it had any (positive) influence on his rankings. And if they did have, that’s even better news – means we can rank good money keywords with absolute garbage backlinks. I am sure you commented on this before somewhere, but I have a question about Layered Links and Do Follow blog comments. If you could provide some feedback or point me in the direction of a previous post, I would appreciate it. I totally get the do follow blog posting comments where you insert your website url and keyword in the poster name fields when you comment. 1. Is there any difference between the url link that shows up in the commenter’s name vs. actually putting a url link with the keyword in the actual body of the comment on these blogs? 2. Additionally, if you have a large site and you are trying to rank inner pages of your site…what happens if you comment on other posts on these blogs and link to the inner pages? Will it hurt you if you have multiple backlinks from the same blog site if they are spread out over several posts and different url links? Will it help you at all? 1. If you put the link in the comment box, its spammy. Don’t do it (unless its actually useful). 2. Sure, you can do this. 3. Its fine, if they are real comments (like all your comments here 🙂 ). But probably doesn’t help a ton as its all the same root domain. Spencer, do you think using a tool such as the GSA Search Engine ranker or similar is a good idea for Tier 2 links? So I originally found your podcast on stitcher, nice. Then saw you posted on John Sheas blog. I had to see the site and the niche site. Love the site for a niche site. It truly is about content more than anything. I wonder about the link building. I typically have done it several ways and had success only a couple sites Ive had took big hits but then I don’t really make a killing on each one anyways they are minimal effort minimal money as I do other ventures offline. Had a couple really good niches a while back that I let go of, long story. I am curious though about one thing. I wonder if visitors from this blog had an effect on your ranking. No bouncing and a pretty good amount of traffic. Regardless Im sure the site would have made it anyways as you definitely picked a good niche to target. But I almost bet google places more weight on bounce rate than people think. I know I would if I ran a search company that wanted to give the best search results it seems that would be a huge metric in an algorithm that judges quality. I don’t really understand why bounce rate would matter that much (to some extent yes, but not a lot). Tons of people visit just one page and never go to a different page on the domain – you could stay on one page only and read it for 30 minutes, and if you exit the domain without clicking another internal link on that website then it will count as a “bounce.” Think of wikipedia – I bet you it has a pretty huge bounce rate, as people often just find one page on the subject they are looking for and then leave. It doesn’t seem to be affecting their results in the SERPs though. What I think would make more sense for google to do is determine the average time spent on site in relation to how long the content on your page is (so the more content on a page, the higher the expected “average time on site” would need to be). That again is a problem though since if the visitor “bounces” then google cannot know how long he stayed on the website as far as I understand it, but I could be wrong here. Either way – I highly doubt bounce rate has much to do with anything. Funny I say that, I just went back to look at your other posts and saw you have a post on time on site. I guess Ill read that. While Im at it, did you give the site address early or not on your podcast. I seem to think you kept it secret but that might have been someone else. Well done Spencer, really pleased to see the positive results that this project is achieving, and gives us all a path forward with our own niche sites. I was wondering what your thoughts are on the recent Squidoo update of nofollow’ing all external links? Would you continue to have content created for a Squidoo lens or do you think it would be better to create more authoritative Web 2.0’s on WordPress, Blogger etc..? If I can give my own opinion on this (though I’d love to hear Spencer’s reply too): I would personally keep using squidoo. It’s just such a high quality site overall that I see no reason not to. Plus, search engines seem to really like them (far more it would seem than a wordpress or blogspot property). Can’t see a reason to ditch it even though it’s nofollow now. Yes I see where you’re coming from and hopefully you’re right as it being an indicator of authority – the fact that you’ve still got a link (albeit nofollow) from a human-edited authoritative website must count for something. As an additional link idea I’ve just been checking out Hubpages and it looks like if you can get yourself a high enough score then they remove the nofollow restriction. great achievement, Spencer. 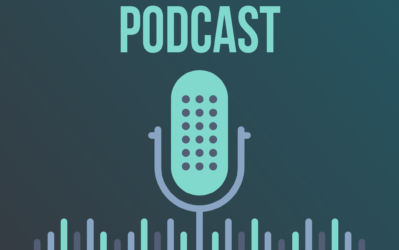 I just listened to the interview you had with Pat Flynn and I am really interested in the strategies you introduced in the interview. I will read more from your site and set up my niche sites soon. Thank you for sharing the great information with most valuable details. Hey Spencer—great content here! Have a quick question for you (apologies if you’ve already answered in the TONS of comments above!). Is there a point in the process that you can tell the site is going to “make it” and you can more safely start investing the larger sums of money like the Layer Links? In other words, what’s the litmus test to minimize financial risk? Assuming there’s never a sign for guaranteed success. Well, you can usually see your site ranking on the 2nd or 3rd page of Google with some very minor links if your keyword research is good. (Comments, web directories, etc). My site actually was ranking on page 1 of Google before I invested in Layered Links. But every site is different…but if your site is doing decent (2nd or 3rd page of Google) – that’s usually a good sign. This is surely a good read. Details like this always motivates me. I’m glad to be following you on this project Spencer. Keep Up..
Hey Spencer, this is my first comment here at Niche Pursuits. Just wanted to tell you that I’ve got an idea with this income report of yours. Hey Spencer, looking to get a package from layeredlinks, could you do a referral? You could get a % sale and I could get a discount. Send me an email. Thanks! CONGRATULATIONS! Since your website is ranked number 1. What is your backlink plan to maintain the site? I likely won’t need additional manual backlinks. Being at #1 will likely get me natural backlinks. Spencer, how many sites do you host on one server? I ask because I heard somewhere when you have a lot of sites with the same IP google might think its a farm and not position you well? I have lots of hosting accounts, some have 10 sites, some have 50 sites+. Congrats on the excellent earnings! Looks like the #1 spot really pays off. Just curious: what kind of Amazon conversion rates are you seeing? Reason I ask is because I’m getting around 12-13% conversion…and after browsing around the internet with this question, it seems that this is high. Or maybe it’s pretty average? I am closer to 2%…I think 12 to 13% is very high. I think mine is a bit low because of all the “non buyers” visiting from my blog here. Yeah, that seems to be closer to what many others reported. Maybe I need to be focused on getting more clicks. It seems like Easyazon might be good for this…but I’m trying to decide if I really need it or not. I already have pretty link pro…would using easyazon in addition to pretty link be overkill you think? You can always try…but would be a bit more work. great. can you do a screenshot of all the plugins you are using? security. jetpack…..or whatever is in there? I believe I already listed these in a previous post. and can you recommend that $25 va or someone specific to send links to the directories? not just fiverr or odesk?. i see that your directories you submited to are relevant like camping etc…so does he source the directories for you too or you do it and how? is there an easy software to submit to those directories and autopilot it for many sites? scrapebox? zenooposter? Hey Spencer, I’ve been following this case study from the start, it’s very inspiring, especially in these days of Panda and Penguin updates! LayeredLinks does look promising – I’ve signed up to a couple of packages for different sites. Great job on developing your site. If find your transparency you offer to be very helpful in building my own sites. It’s really gratifying to see someone who practices what he preahces, instead of big-winded claims. I have no doubt that $500 a month is in the bag and just the start. Your success demonstrates that a solid applied plan, great content and plenty of smarts adds up to a terrifiec formula for success. Don’t forget that imitation is the sincerest form of flattery, so I wouldn’t sweat the 3rd rate competition too much. Those folks are deomonstrating that they lack talent and orginality. Congrats & thx. Spencer…you are an angel. I have just read your blog till NSP Update 2 so far and downloading your webinar as I type. I will watch it tomorrow and then follow everything you have done (except maybe spending on paid products for starters since I’m very low on cash right now). I will definitely keep a record of what I’m doing and then share the results with you. I think you have been blessed Spencer. You have shown me (and most visitors of your site I think) what I haven’t seen so far in 3 books I’ve read on SEO and Affiliate Marketing (namely SEO for Dummies 1st and 4th editions by Peter Kent and How I Made My First Million on The Internet by Ewen Chia). You have inspired me and given me hope! God Bless You! and may you make millions! Do you think you can show us what were the SEO competition values and commerciality numbers that you originally had when you did the research for this specific niche using Long Tail Pro or Market Samurai? This is going to be interesting to see how well those numbers convert to Amazon Associates sales. Thanks for putting all this out there, hugely useful, but also well written and interesting. I’ve just downloaded long tail pro platinum, and have a question, ho hard is it to go up against ecommerce sites? I’ve found what looks to me (with all my 2 days experience…) to be a killer, KC score of 25 etc, but all the sites are ecommerce, how much harder is it to rank against them? I usually avoid ecommerce sites. These play by different rules; so even though they have low links, etc – it appears that Google wants to rank ecommerce sites for these keywords. I’m going to write a post on this because I get this question ALOT. Having spent a few more hours looking at a million different keywords, it definitely seems that way, so interested to read your post on the subject. By the way, I freaking love this software, I’m Super excited about all the value I’m going to get out of it!!! Excited to see your May results in a few days hopefully!!! Amazing results Spencer. Thank you for sharing all this stuff. BTW, I have a niche site ranked on 111th spot and I want you to review it and tell me what should I do to rank it on the first page of google please. Could you do that please ? I did use that feature; but you are right that I think the tablepress links don’t work dynamically…I may have to look into that. Today I saw on google that a copy-cat site had overtaken your site. And it has shamelessly used the table from your site too. Looks like you now have a competitor, like to know your thoughts on this. Hey loving the information it’s great. Just a quick question, why do I keep getting Godaddy popups with similar keywords popping up in LongTail? I’m using the trial, is this supposed to happen, seems a bit buggy and a little discouraging. Others are not experiencing this. Please submit a support ticket to longtailpro.com/support – that’s the place for software support. Thanks! I don’t know if you remember me mentioning, but like so many others here, I was inspired by your project and started 3 of my own niche sites in April. So I just wanted to thank you for doing this. I’ve learned a lot from you, and I’m continuing to learn. Am looking forward to the next update or next niche project. That’s great! Thanks for sharing Chris. You’re Number 1 in the UK! Paul (The ‘Copycat’) is 2nd however, I have seen him pop in a few of the comments on your posts so he knows you know lol! I don’t think he regards himself as a copycat though. The way he speaks in his comments makes me think he’s trying to gain awareness/ traffic by challenging your SEO. (As fuss is made here, he gains more traffic, awareness, followers etc). I don’t really think it’s an attack necessarily at your niche or project, it’s more like a nasty way of advertising. I call it ‘nasty advertising’ because this is for a project and we are learning from it. However, in essence, he’s just doing what we’re trying to learn how to do. Sure his content is by no means great and the table is blatantly your idea but he is still ranking and in some cases above you and more than likely is making money still. I still think it’s great what you are doing! As a student from the UK, I first was involved with online income about 4 years ago with YouTube and Adsense. Then I made a blog which gathered a few thousands visits in a short period of time and earned me over £100 in a week! I felt like a millionaire at the time haha. That was short lived as I was banned on blogger by an automated bot claiming, wait for it, I was automated! It’s hilarious now, but at the time I’m sure you can imagine my frustration. Since then I’ve taught myself web development and I have been researching and reading about niches and IM for the past two years! These past few weeks you have really ignited my drive again. Now I intend to actually do rather than plan to do. The problem I have is when I have planned and ‘figured it out’ I feel like I’ve already won, but without doing it nothing can be won! Thanks…and best of luck Nick! Love this help Spencer, I am wondering what your thoughts are on a super targetted adsense micro niche site that only has 60 local searches per month with no competition BUT with a ppc over $50-00 ? I have found several of these keywords using LTP that could be replicated lots of times very easily, but would it be worth the effort ? It wouldn’t be worth it. You would actually get paid $50 to $100 per click. You have to remember that CPC numbers are for the SEARCH network (ads on Google.com); ads on your site will get much less. I would never expect to get much more than $1 or $2 per click. Anything extra would be a pleasant surprise. Great break down. love the work you are doing! So in the end how many Amazon affiliate links did you go with on the frontpage and how many do you have total on the site? I follow you from France ans I’ve a little question for you. If, in addition to the niche on survival knives, you spotted others niches opportunities on close subjects like survival blankets or compasses, have you created a full site dedicated to the survival equipment? Or would you have created a website for each niche? Or both? I could probably just add the pages about survival blankets on my survival knife site; I see no problem with that. But if I think its a big enough niche on its own, I could create a new site. Spencer, has you opinion stayed the same on layered links? If you were to do this over again would you use them? Anything you’d do differently when it comes to link building? I’d still use them. For niche sites, I’m not afraid to hire link builders. For a real authority site, I would never “build” links though. Its a big difference.